Steep Hikes In Insurance Rates Force Alaskans To Make Tough Choices : Shots - Health News Alaskans have the highest rates for health insurance in the country. Many get a subsidy to help defray the cost, but those who don't wonder, increasingly, whether it's time to go without insurance. Anchorage dental hygienist Victoria Cronquist pays $1,600 a month for a health insurance policy that covers four people in her family. Next year, she says, the rate is set to jump to $2,600 a month. Gunnar Ebbesson is used to paying a lot for health insurance, but the small business owner from Fairbanks got a shock recently when his quote came in for next year's coverage. "I don't understand who can afford this," he says. "I mean, who really can afford this? I can pay it, but I can't afford it." The premium for his family of five came to more than $40,000 a year. That's for a bare-bones plan with a $10,000 deductible — the plan that's through the marketplace set up by the Affordable Care Act. Customers can begin buying plans on HealthCare.gov starting on Nov. 1, and do so through Jan. 31, 2016. Rates for individual health plans went up an average of 7.5 percent nationally, but Alaska is a special case. It has the highest premiums in the country and it has seen some of the highest percentage increases over the past two years. Why that's true is still murky. There are a tangle of suggested reasons that likely play a role — among them that the state has relatively few doctors in certain specialties, only two insurers offering plans on the individual market, and relatively few people seeking insurance that way. What's clear is that a lot of people who have to buy that insurance are feeling the pinch. Ebbesson makes a good living and he doesn't qualify for a subsidy to help pay for insurance because his family income is more than $142,000 a year. But, he says, his insurance costs more than his mortgage. "I'm not able to put money in retirement, savings for my kid for college — my 10-year-old. Believe me," he says, "I could find lots of stuff to do for my future with $40,000." Ebbesson supports the Affordable Care Act. He calls the Alaska rates a wrinkle in the law that needs to be fixed. The average 2016 premium for a 40-year-old in Anchorage is $719 a month — more than double the national average. Most Alaskans, and most Americans, qualify for a subsidy that rises with premium increases — insulating consumers from the big jump. But about 5,000 Alaskans pay the full sticker price. "We want people to have access to affordable coverage and that's not happening right now in the marketplace in Alaska," says Eric Earling, spokesman for the insurance company Premera Alaska, one of only two companies selling on Alaska's exchange. Earling says even with the high prices, the company is losing millions of dollars on Alaska's tiny individual market. He says in the first six months of this year, 37 Premera customers filed over $11 million in claims. "The important thing is they deserve access to coverage, and we're glad they have it," he says. "The trick is creating a sustainable environment where those costs can be absorbed in a way that doesn't adversely impact all consumers." Premera is proposing legislation that would use Alaska's high risk pool to allow the biggest claims to be paid from a special fund. The state's Division of Insurance hasn't taken a position on the idea. Victoria Cronquist is a dental hygienist in Anchorage. She doesn't care what the solution is, as long as it helps her find more affordable insurance. "It's just getting too expensive," she says. "I'm up against the wall. I can't do it all." 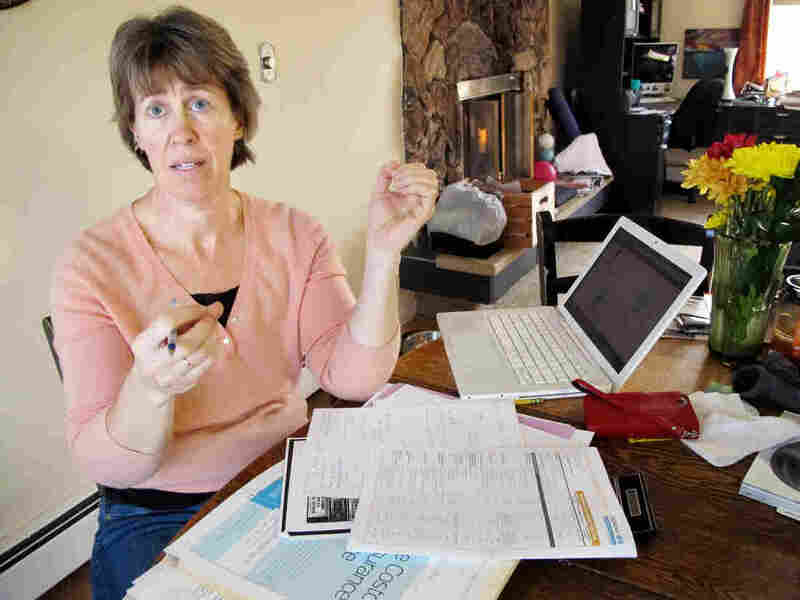 This year, she pays $1,600 a month for herself, her husband and two kids, ages 16 and 20. She gets a stipend from her work to help pay that premium, but her rate is going up to $2,600 a month next year. And her stipend isn't going up. Cronquist says she may cancel her insurance. "To be quite frank, to have a $2,600 monthly premium payment and all this is stressful to me," she says. "Extremely. And that increases my odds of getting ill! That's the other way I look at it." Cronquist doesn't take the decision lightly. Her family has dropped health coverage in the past. They had to pay a steep price when her daughter ended up in the ICU a few months later. Gunnar Ebbesson, from Fairbanks, also has a difficult decision ahead. He's thinking about dropping his policy and putting money toward savings instead. Ebbesson says his family could fly to Thailand for any big, necessary medical procedures. If something catastrophic happened, though, it would put his family in a tough position. "It's a scary proposition," he says. "There's always bankruptcy but, my goodness, why should I be having to even think about things like that related to my health insurance?" The high rates will push more Alaskans into a category that allows them to avoid paying the penalty for going uninsured. The law includes an "unaffordability" exemption if the lowest cost insurance amounts to more than 8 percent of your income. This story is part of NPR's reporting partnership with Alaska Public Media and Kaiser Health News.